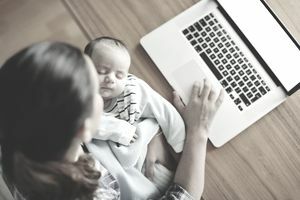 Before you return to work from maternity leave, you may want to write a letter or email to set expectations for your return. This correspondence could be sent to your company's human resources director, your supervisor, or both. Consider the suggestions and the sample letters below as a starting point. You can use this message as your opportunity to express that you're excited to return to work. Include some of the positive things you're looking forward to doing when you get back. You can also list new ideas or projects, or write that you look forward to catching up with everyone. You will experience a back-to-work transition period regardless of how long your maternity leave is, and writing this letter is an opportunity to address it. If you can think of anything to help make this transition easier, request it in this letter. For example, if you'd like to discuss changing your hours to part-time employment or working a flexible schedule, bring it up here. Also, state any previously agreed-upon changes to your work schedule. If you're going back to the same position you left before maternity leave, state your intent to resume your position. If you wrote a maternity leave letter, include a copy of it or mention it in this new letter to remind your employer of when your maternity leave began and when it's scheduled to end. Also, let your employer know if you want to come back earlier. Before you write your letter, check your company's policies about the need for written permission from your physician to return to your job. If you have any medical restrictions due to a complicated pregnancy, state these concerns clearly and attach the note from your doctor. As with all written correspondence, it's wise to make your letter short and to the point. Below is a sample letter for reference. If you aren't seeking any changes upon turning to work, then use this sample letter as a guide. Replace the words in brackets with the details that appropriate for your situation. Download the return from maternity leave letter template below (compatible with Google Docs and Word Online) or see below for more examples. Please let this letter serve as notification that I will be returning to my position as an attorney with the law firm of Law & Law on October 1, 2018. As you know from my maternity leave letter, I began my leave on July 1, 2018. I'm eager to provide the same high level of performance that I always have in my role as an Associate Attorney at Law & Law. [If applicable, include the following:] Enclosed are release papers from my physician stating my ability to resume my job position. Please contact me with any concerns. If you've made an adjustment to your position or work schedule, such as returning part-time or working a flexible schedule, use the below return-to-work letter for reference. Please let this letter serve as notification that I will return to work on a part-time basis on October 1, 2018. As agreed to by Carey Lee, I will be working [cite your schedule, e.g., Monday through Wednesday from 9 a.m. to 2 p.m.]. As you know from my maternity leave letter, I began my leave on July 1, 2018. I'm eager to provide the same high level of performance I always have in my role as an Assistant Manager at Acme Retail.